An attorney who practices “family law” in Oklahoma practices in a variety of areas of law, including: divorce, military divorce, legal separation, paternity, child custody and visitation, child support, and custody and support modification. 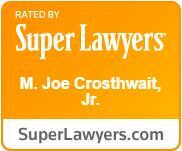 While each one of these practice areas have their own intricacies, the family law attorneys at The Crosthwait Law Firm, conveniently located in Midwest City near Tinker Air Force Base, are experienced in all aspects of family law, including divorce, legal separation, paternity, child custody, child support, and custody modification. For more information on any of various areas that make up “family law” in Oklahoma, click on the words as they appear in the paragraphs above, or choose from the drop-down menu at the top of the page.